A fun Weather Blog that’s filled with seasonal facts and safety tips about the weather and how it affects us on a daily basis. While there are plenty of helpful (and even life-saving!) tips to help you prepare for and survive severe weather events, the weather’s not all bad around here! There are lots of FUN things to see and do related to the weather as well. 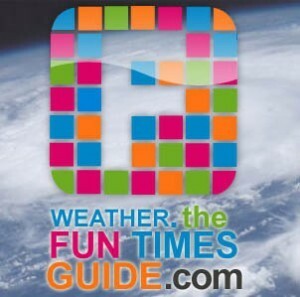 The information found at The Fun Times Guide to Weather is provided by TV meteorologists and amateur weather junkies who are intrigued by everyday weather events — how they form and ultimately impact our world. They graciously share their insights about the weather for all to enjoy. So, as the seasons change and Mother Nature shows her true colors in various ways throughout the year, check here for fun and helpful ideas to get you through the Spring, Summer, Fall and Winter with a smile on your face while keeping your family safe & sound.